Gingerbread houses are a staple this time of year, but you don't really get to eat them, it's not fair. 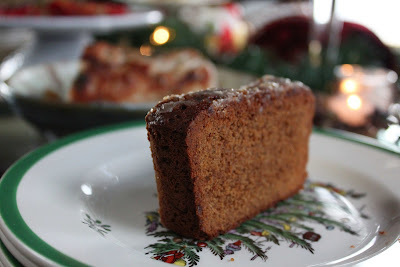 So I decided to create Ginger Molasses Quick Bread, similar to a banana or pumpkin bread, but this certainly has it's the holiday depth of a house baked right in. This bread was designed more as part of a holiday brunch or meal rather than a dessert so it is ever so slightly savory and not overly sweet, but a scoop of ice cream or even fresh whipped cream on top of a warm piece of the ginger bread would be scrumptious! Or toasted with a little warm butter would be a great snack! Trash the house and add something edible to your holiday baking with a yummy and warm Fat and Happy Ginger Molasses Quick Bread. Tips and techniques: Watch this closely and take it out of the oven immediately to avoid over baking, which will turn the bread dry. Do drizzle the glaze on the bread while it is still warm to allow it seep into the bread. Preheat the oven to 375 degrees. Sift together all the dry ingredients. Whisk together the eggs and sugar until the eggs are pale, fluffy and double in size. Continue to whisk while slowly drizzling in the oil and then add in the molasses and the melted butter. Using a rubber spatula, fold the flour into the batter in three batches, add the candied ginger with the last batch of flour. Only mix the dough enough so that everything is moistened. Pour the batter into 2 greased bread pans (or 4 mini bread pans), tap the pans on the counter to release any air bubbles. Bake for 50 minutes or until an inserted toothpick comes out clean. Mix the cinnamon glaze (recipe below) while the bread is baking. Melt the butter and whisk in the milk, powder sugar and cinnamon. Keep warm until ready to use. 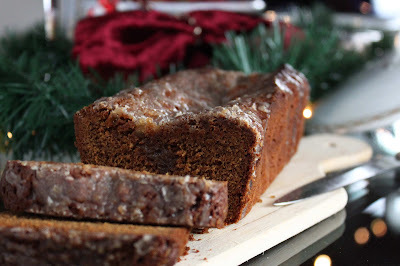 I came across this by googling ginger molasses bread. I made it to bring to a meeting today - it was delicious and my coworkers loved it! I only had 1 egg so I subbed 1/3 cup applesauce for the other, which worked great. I will definitely make this again! Perfect for fall and winter. So glad this worked out for you - great substitution with the applesauce!